SRAM HydroR-The Evolution of Control. The SRAM Rival 22 HydroR brakeset is loaded with features that fulfills on the promise of better braking, more control, & improved performance in all conditions. Silky smooth & effortless braking at your fingertips. If you believe in better performance then you should believe in hydraulic road (HydroR) brakes. Quite simply, the SRAM 2015 HydroR technology is the fulfillment of the promise of better braking, more control, and improved performance in all conditions. Pictured is the Red 22 HydroR brakeset. 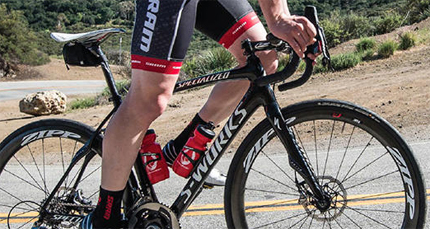 For 2015 SRAM have several road groupsets featuring a broad complement of hydraulic braking options for both rim and disc brake bikes. Each delivering on the promise of braking confidence and security that brings speed control and stability to a new level.